At Auntie’s Doggie Daycare Preston we recognise that people have busy lives and that the health and wellbeing of their dogs is important to them. Aunties Doggie Daycare is about removing the anxiety of having to leave your dog home alone whilst you spend a long day at work, then have to come home and exercise them. At Auntie’s Doggie Daycare Preston we provide a high quality daycare service for your dog in our customised daycare facility between Monday and Friday each week* (*excluding public holidays and centre holidays). Dogs naturally socialise together and gain a lot of stimulation from interacting with each other. Providing this is done in a professional and sympathetic manner, dogs can learn canine etiquette (doggie manners!) and are soon enjoying rewarding days at daycare. To enable us to provide safe, stimulating care, Aunties Doggie Daycare has some “School Rules” that must be adhered to for not only the safety your dog but also our other dogs and staff. These rules include neutering and inoculation requirements as well as an assessment of behavioural tendencies. 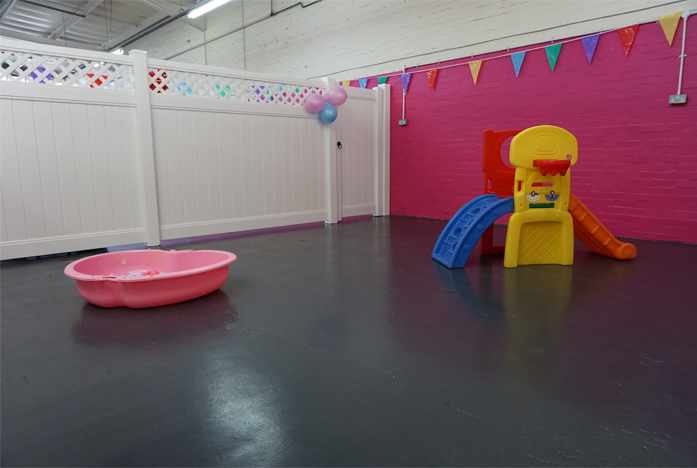 The 5,000 square foot facility boasts a large open exercise arena, a dedicated rest area, Puppy Daycare and Birthday Party Room. The large exercise arena has, play pits, slides, climbing frames tunnels and much much more to ensure your dog has a fun packed day. The rest area has sleep pods so that the dogs can relax and sleep in peace. The centre is open from 7.00am to satisfy the needs of those who need to get to work and is open until 6.30pm for collections. On a daily basis activities are organised to stimulate the dogs and these range from general play to treasure hunts and dog agility. A specially designed day care service for your young pup to learn the skills they need around other dogs. This is the perfect stepping stone to full doggie daycare. They are given special care by our staff, allowing times for meals and naps as required and we provide the pawfect environment for them to grow and socialise. From playing with other puppies, they are gradually introduced to other day care dogs and they go for walks along with the other dogs to experience as much as possible and get them fully socialised.